Three piece traditional shaving set featuring: Mach III style razor, badger brush, weighted stand, Includes Gillette Mach III blade. With its glossy piano key black and silver plate construction, this hefty set is the one Grandfather wishes he had. Includes Gillette Mach III blade. With its glossy piano key black and silver plate construction, this hefty set is the one Grandfather wishes he had. 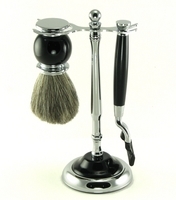 With its faux ivory and silver plate construction, this hefty set is the one every Grandfather wishes he had.